VFL: Wangaratta trip in 60 seconds Watch highlights and key moments from the VFL Magpies 11-point loss to Werribee at the Wangaratta Showgrounds on Saturday. 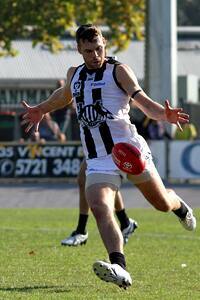 Matthew Scharenberg was one of Collingwood's most impressive players in an 11-point loss to Werribee. Photo: Shane Barrie. For 30 minutes, Saturday’s trip to Wangaratta looked set to be the turning point of Collingwood’s VFL season. The Magpies had kicked seven unanswered goals, were kicking straight and had full control in almost every facet of the game. Three quarters later, spirits were far more subdued after a remarkable Werribee comeback. The North Melbourne-affiliated Tigers claimed an 11-point win, leaving Jared Rivers and his group to wonder what might have been. What the Magpies were able to achieve in the first term, Werribee comfortably replicated in the second. The ‘home’ team kicked seven goals to three to cut a 41-point quarter-time margin to just 18 at the main break. Rotations on Collingwood’s bench dwindled as the game progressed. Tim Broomhead emerged from the half time break in a tracksuit after a second-quarter concussion, before Jesse White joined him with a suspected hamstring injury. On what would no doubt be his first trip to Wangaratta, Mason Cox impressed with a time-high four goals. Kayle Kirby and Ben Crocker joined him as multiple goal-kickers with two each, while defender Jordan Kelly snuck forward to kick a pair of majors. Standing alongside Kelly for much of the game was the returning Tom Langdon. Donning a black headband which would do Bjorn Borg proud, Langdon came on before quarter time and played confidently in defence. Matthew Scharenberg impressed once again, while Callum Brown played arguably his best game for the club, despite his dad Gavin watching on from the Werribee coaches’ box. After spending the night in Wangaratta leading into the game, the VFL Magpies will now board a bus back to Melbourne and turn attention towards a round six clash with Box Hill.